If you ever study Communications, Psychology or Sociology you will most definitely learn about Phrenology. It is a 19th century neuro-scientific theory which hypothesises that personality traits can be attributed to the shape of the skull [to describe it quickly]. 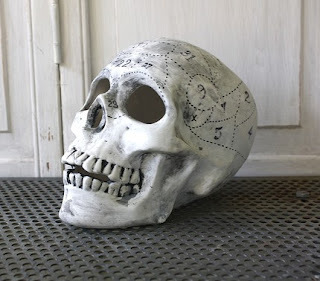 I always enjoyed contemplating Phrenology and linking it to more current theories regarding personality traits, so when I hopped onto Etsy today, I was delighted to see this adorable skull lamp with a "Phrenological-twist" made by shavingkitsupplies. These would be amazing as Halloween party decorations, wouldn't they? Then, after the holiday is over, it would make for a conversation-starting decor piece at any time of year in your home. What do you think of this unique piece? For Thanksgiving I tried out a recipe I'd never made before. I'd bought these cute little loaf pans from Michaels, but unfortunately they were more novelty than practical and the dessert I made in them didn't exactly turn out exactly as I'd hoped. Of the three I made, only one turned out, but apparently it was delicious which made me quite proud. 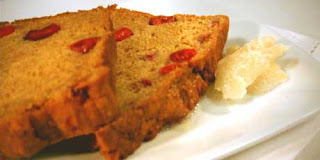 So without further ado, here is the yummy recipe for pumpkin cranberry loaf! Sift together flour, baking soda and powder, salt and spices and set aside. In a medium bowl, cream together butter and sugar until light and fluffy. Add eggs, one at a time, and stir in pumpkin purée, orange zest and vanilla. Stir in orange juice. Add dry ingredients in additions and blend just until incorporated. Fold in cranberries. Spoon batter into loaf pan and bake in center of oven for 60 to 75 minutes until a tester inserted into the loaf comes out clean. Allow to cool before slicing. I did mine in a small ceramic loaf pan and it took slightly longer than the indicated cooking time here. What dessert did you make for Thanksgiving? As seen on the Food Network show Sugar.